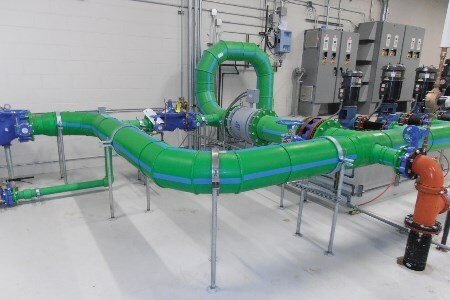 The Plastics Pipe Institute, Inc. (PPI) has announced the creation of the Polypropylene Pressure Pipe Steering Committee within its Building and Construction Division (BCD). This new group will focus entirely on polypropylene pressure pipe, and is a significant development for PPI in supporting this industry. PPI is the major North American trade association representing all segments of the plastic pipe industry. The Steering Committee focuses on two types of polypropylene pressure pipes: PP-R (polypropylene random copolymer) and PP-RCT (polypropylene random copolymer with modified crystallinity and temperature resistance). Both types of pipes are approved for potable hot and cold water plumbing systems, hydronic heating and cooling systems, as well as other applications. PP-R and PP-RCT pipes are available in metric sizes ranging from 16 to 355 mm and IPS schedule 80 sizes ranging from 0.5 to 6 in. The minimum hydrostatic pressure ratings are 160 psi at 73°F (1105 kPa at 23°C) and 100 psi at 180°F (690 kPa at 82°C) for plumbing applications, but pipes with different dimension ratios (DRs) can have higher or lower pressure ratings, as needed by the customer. The mission of PPI’s Building & Construction Division is to promote the expanded acceptance and use of high-reliability plastic pressure pipe and tubing systems in building and construction environments by providing research, education, and code and standard development with a focus on delivering sustainable and safe plastic system solutions that enrich people's lives. In addition to co-ordinating industry research programs, developing technical publications, and creating educational information about these systems, the PPI technical staff participates within the standards development organisations (SDOs) ASTM, CSA, and NSF, code bodies IAPMO and ICC, as well as other organisations such as ASPE, CACP, PMAC and RPA. The first publication related to polypropylene (PP-R) pressure pipe is PPI TN-57 Proper Integration of Copper Tubing and Components with PP-R Piping Materials for Plumbing Applications, which was published in June 2018. The purpose of this technical document is to provide information regarding proper integration of copper tubing and components with random copolymerised polypropylene (PP-R) piping materials for plumbing applications. "This document is a great example of the kind of educational content the P4 SC and PPI can generate to help the industry as a whole," MacNevin commented. The document can be found here.